It was mid-January when a Coolworks.com post popped up on my screen. “What is this!? !” I had retired from a flight attendant career five years earlier and to say I was itching for some excitement would be an understatement. I had never spent much time in mountainous states. I came from Iowa, and I felt I had been dropped from the sky into an unbelievable scene. 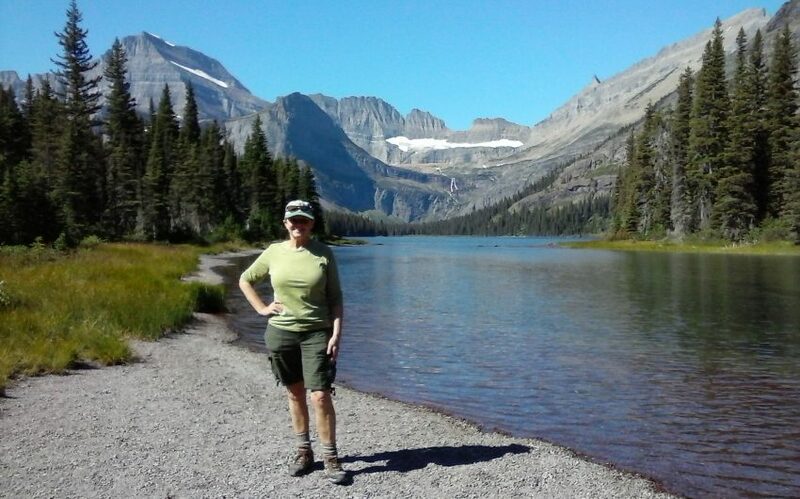 I still can’t believe my first sight of Glacier National Park; I couldn’t stop smiling! I awoke every morning to beautiful sunrises because I was blessed to start the coffee at a historic Lodge, Many Glacier Hotel at Heidi’s, an iconic coffee and snack shop. It was the last Hoorah because the hotel was scheduled for a two-year renovation. I met coworkers from all over the world. I had a summer of Hootenannys, kayaks, horseback riding, and hiking to see the last existing glaciers. I saw bears, mountain goats moose, and big horn sheep every day. It was like summer camp for grownups, with a little mischief thrown in. It was fun! I left at the end of the season and I was hooked! I applied for retail at Big Sky ski resort – back to Montana! I was drawn to move to Montana to experience that lifestyle. I have spent a year exploring around Flathead Lake. Next, I decided to do another work vacation, this time in Yellowstone Park this summer for five months. I had researched many choices on CoolWorks again from Alaska to San Juans, and I quickly chose Yellowstone when the opportunity presented itself. I expect more wildlife to photograph and more hiking and exploring. I tell everyone to jump at the chance to have a work vacation if you can, and Coolworks.com will give you choices all over the world. GET OUT THERE!